Microsoft Dynamics 365 for Customer Service is a powerful system to unify the way people experience your business. It makes information available across engagements so your agents can offer the consistency and personalization your customers expect (and require). One area that we feel is especially powerful for our clients is Case Management. With that in mind, in this post we will give an overview of how Case Management works and the high level benefits. Then in our next post we will talk about specific industries, including many outside the traditional “customer service” model, and how they benefit from Case Management. Microsoft Dynamics 365 Service Management is designed to support incident based services called Cases. The Case Entity provides incident based tracking for issues that may arise from customers, whether they are external or internal. A customer service representative creates an incident (case) to track a customer request, question or a problem. 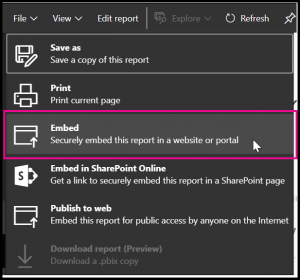 All actions and communications can be tracked in the incident entity. An incident can be in one of the three states Active, Resolved or Cancelled. Microsoft Dynamics 365 Cases are commonly used in help desk scenarios, where a customer has an issue with a product or service. Then the activities to resolve the issue can be tracked in an organized way from when the issue was first reported to resolution of the issue. 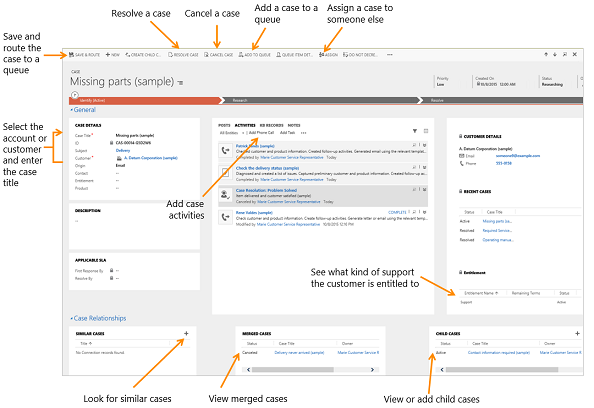 Keep track of the customer requests and issues by creating support cases in Dynamics 365. When a customer contacts support with a question or problem, it can be quickly verified if there is an existing case or open a new case and start tracking the issue. The cases can also be escalated, reassigned, or put a case back into the service queue if enough information is not available or due to time constraints. Before providing support, Customer’s entitlements can also be verified. Entitlements are like contracts that illustrates about the type of support a customer is eligible for. Support channel, or based on the product or service that the customer has purchased. To help you select the right status of a case, your admin may have set things up so that you only see a limited set of status based on the current status of a case. System receives an email regarding any issue. Cases will be automatically created from email messages. Send automatic email response to the Customer for the ticket creation. This ticket will be routed to the Support queue. The ticket will then be assigned to specific CSR based on the routing rules set in the CRM system. CSR will make further communications with customer. CSR will resolve the case and notification will be send to the customer for the case resolution. 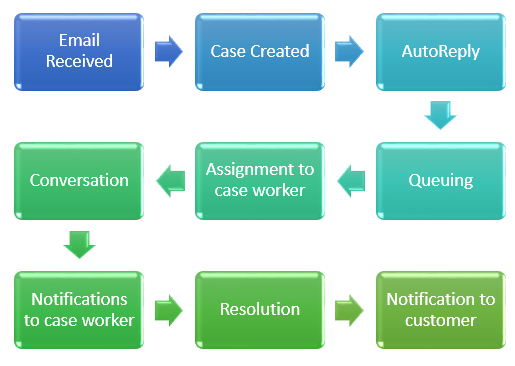 Track customer issues through cases. Record all interactions related to a case. Create queues, and route cases to the right channels. Create and track service levels through service level agreements (SLAs). Define service terms through entitlements. This powerful application within Microsoft Dynamics 365 can be used across many industries. In our next post we will give examples of the type of companies that we have seen use “Case Management” in new and creative ways. If you are interested in exploring Microsoft Dynamics 365 Customer Engagement applications for your business contact Crowe today. Can you pinpoint what guests love about your restaurant? It is your food for sure, but it is likely more the menu that leaves them wanting more. Could it be your ambiance? What about your friendly staff? Or, timely service? After all, you place just as much emphasis on these important touches as you do the food you serve. If not, you may want to re-think your strategy. Excellent guest service keeps bellies full and restaurants in business. In fact, good guest reviews are a barometer of a restaurant’s success. “Restaurants simply cannot survive on first-time diners. It’s essential that good food and great guest service drives repeat business and successful restaurants,” noted Nancy Friedman, a featured guests service trainer and speaker to dozens of industries, including the restaurant business, in Modern Restaurant Management. Maybe great service means knowing a regular’s favorite booth, how a diner takes her coffee or, simply getting orders filled quickly, correctly and with a smile. Whatever it is, guest satisfaction is why some restaurants succeed and 17 percent fail after the first year. On average, Americans will spend over half of their food budget on restaurants in 2019. Since restaurants reach about $ 825 billion in annual sales, according to the National Restaurant Association, restaurant owners must tap into those profits with great guest service. Here are three top restaurants doing just that, according to American Customer Satisfaction Index (ACSI), and what you can learn to make your service go from good to great. No one can deny the loyal guest base of Chick-fil-A, but did you know it’s been the best fast food restaurant for guest satisfaction four years in a row? There are many reasons for the restaurant’s popularity from being known as the most polite staff to its guest loyalty rewards program. Guests feel they get speed and accuracy of fast food services with the friendliness of traditional restaurants. Plus, Chick-fil-A knows how to cater to its consumers; the company continually asks what makes them happy. Millennial guests said they dislike waiting in line, so Chick-fil-A launched a new app for ordering before you arrive. It gave away 131,000 free sandwiches for early downloaders. With over one million downloads in three days, the company not only locked in repeat guests, but also improved the ordering process to maximize profits. Top off these guest-service wins with their “less guilty” pleasures of chicken sandwiches instead of burgers, and you see why this restaurant chain has remained at the top of ACSI list since 2015. Texas Roadhouse and Cracker Barrel have been battling for the number one spot in sit-down dining guest satisfaction, but in 2018 Texas Roadhouse took the bull by the horns. And, it’s no surprise why this full-service restaurant took the lead, two words: free food. Texas Roadhouse prides itself on down-home ambiance and casual dining and gives away complimentary food from the moment you sit down. All guests are given free peanuts and freshly baked warm rolls with homemade cinnamon butter. According to Delish, the chain goes through 8 million pounds of peanuts a year. Texas Roadhouse also serves high-quality meat in every cut from each location’s own private butcher. Combine this expertise with friendly staff and low prices, and you can see why this restaurant took the top slot in 2018. The last restaurant on the list is unique because it doesn’t fit a category as easily as the first two. Yet, the chain still performs well in terms of guests satisfaction. It lives up to its vague categorization of fast-casual dining, but unlike Chick-fil-A, it does not portray a fast-food chain vibe. Instead, it opts for a bakery-café culture. Like Chick-fil-A, Panera Bread has an app for ordering food easily, so it wins for fast guests service, rapid take-out services and other modern conveniences like free Wi-Fi for in-restaurant dining and relaxing. Like Texas Roadhouse, the restaurant bakes fresh bread daily. What makes Panera Bread unique, and continually a guests pleaser is their menu’s variety. You can get everything from pastries and sandwiches to soups (in bread bowls), salads and entrees for adults and kids, alike. Plus, it has an extensive drink menu. Most notably is the dedication to the health of guests. The chain was one of the first eateries to list calorie counts on menus and provide safe meat products like free-range eggs, antibiotic-free meat and chicken at scale. The company also has community cafes to feed those in lower income areas with a pay-what-you-can system. What each of these restaurants shares in common is good food and a dedication to what their guests want and need from them. This, in turn, translates to higher sales, continued success and a dedicated fan base who will always know what to expect when they enter their doors. With a platform like Act-On, you can be up and running within a month, but developing your content, setting up your workflows, and creating personalized and segmented lists using behavioral triggers will take additional time and resources. Through an analysis of thousands of customers, we’ve determined three key factors that will determine your success using a marketing automation platform. We call them the Fundamental Three. These seem fairly simple (and they are), but there is a technical component to each. Too often, a marketing person is dependent on someone from IT or their outsourced “website guy” to install the tracking beacon, which allows you to track the engagement activity of any known and unknown visitor to your website. So when someone goes from “anonymous” to “known,” you’re able to retrieve their previous history interacting with your digital properties. Once you have converted that website visitor from an unknown prospect to a known lead, you want to begin nurturing that relationship and educating them about why they should do business with you. This means creating segmented, personalized email lists (as opposed to the batch and blast of a level one marketer) so your content speaks to their unique needs. These are just a few areas where a MaaS provider can help your marketing team onboard with your marketing automation platform, get trained with the software’s capabilities, and begin creating effective campaigns. What Does Marketing as a Service Include? End-to-end MaaS providers, like Act-On, provide in-depth training on your new marketing automation platform, help with key integrations, and suggest proven tips to ensure email deliverability. As a new customer, you will also receive world-class onboarding. Lastly, your MaaS provider should offer a full suite of marketing accelerators in either an a la carte fashion or as a package. This way, you can pick and choose which accelerators are most critical to your current business needs. At Act-On, we segment our accelerators into four categories. Inbound: Assistance building your inbound marketing programs, identifying the content you’ll need to develop, and creating the forms to convert all that content. 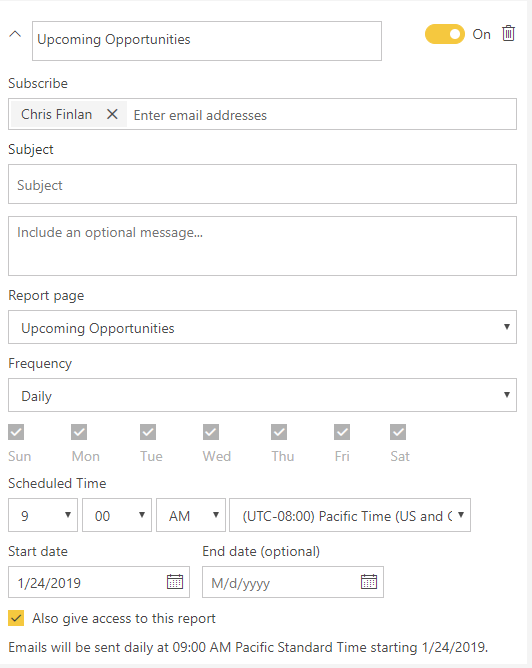 Outbound: Help creating automated programs to send segmented demand generation and nurture emails to your prospects and customers. You’ll also get assistance with event promotion and integrating offline marketing activities with your online presence. Lastly, we guide you through the nuances of transactional and sales emails and create a system capable of sending both to your various email lists. Sales: Covers lead scoring, lead qualification, CRM integration, and setting up sales productivity tools. Loyalty: Learn best practices for cross-selling and upselling, developing nurture programs for onboarding new customers, and creating trigger emails based on customer behavior and activity. So if you’re looking for help setting up your marketing automation platform and developing effective marketing strategies, please contact Act-On today to learn more about our Marketing as a Service solution. 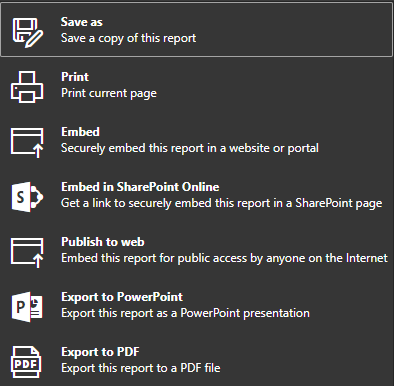 With our February update of Power BI, you can now share, publish and view Python visuals in your reports and dashboards. This update extends the support for Python in the Power BI Desktop to the Power BI service. 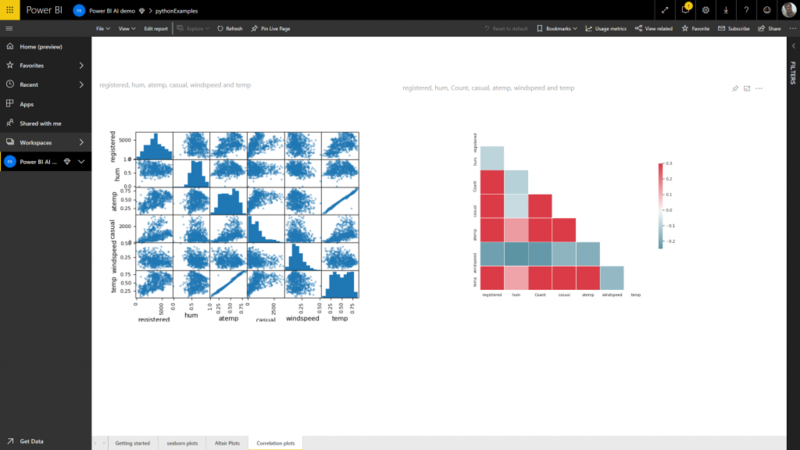 This ability completes the support for Python in Power BI, enabling you to use Python scripts to prepare your dataset, apply sophisticated analytics or machine learning in the Power BI Desktop & personal gateway, and then plot the results in your Power BI reports using any of the hundreds of open-source Python visualization packages. 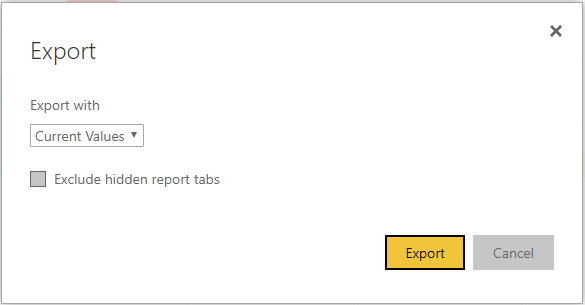 Publishing your reports to the Power BI service will automatically refresh these visuals with the latest data when a user views the report. Just like the support for R visualizations in Power BI, your Python visualizations will update with cross-filtering in the report, but the visuals are not interactive. 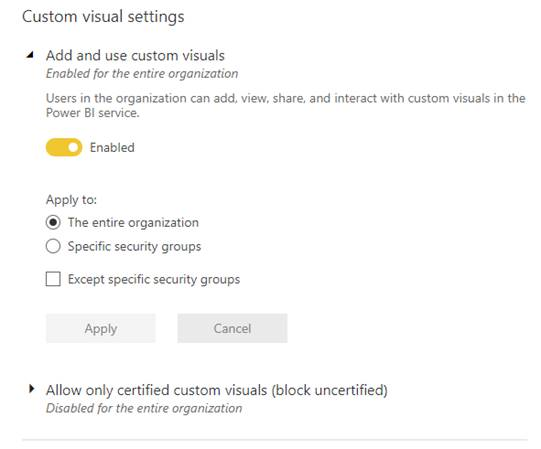 You can add a Python visual to your Power BI report by selecting the Python visual icon from the Visualizations pane in the Power BI Desktop, which adds a placeholder Python script to the report. Adding the fields from your dataset to the Values pane of the Python visual, automatically adds the fields to the pandas DataFrame in the placeholder Python script. You can then use the Python script to create the visualization you’d like. See Create Power BI visuals using Python for instructions. 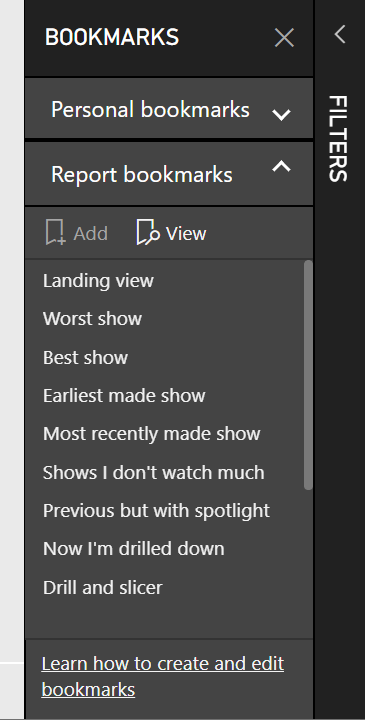 When you publish the report the report to your Power BI workspace, the visuals are automatically refreshed when the report is viewed. Note, there are a few constraints on the size of the serialized Python dataframe, and the execution resources used by the Python scripts, that are summarized below. The initial version of the Python runtime supported in Power BI includes versions 2.7.15 and 3.7.1. We will periodically update the runtime to keep it current. We’ll include the versions of the packages supported in the documentation for the Python support in Power BI. 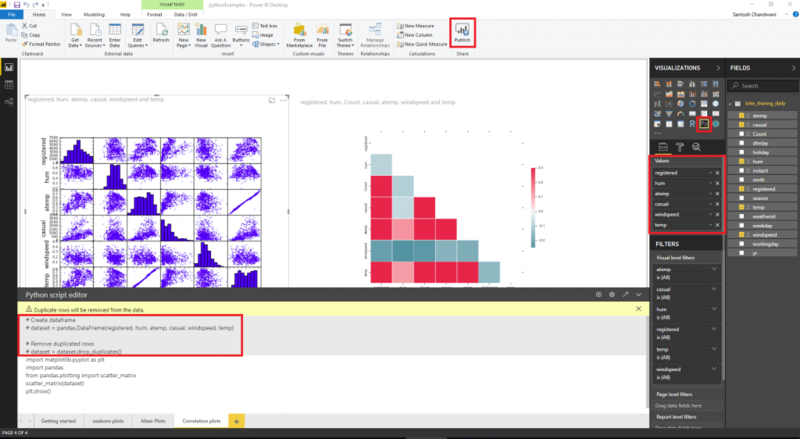 The Python scripts in your reports are executed by the Power BI service in an isolated sandbox that restricts the access of the scripts to the network and the other machine resources. 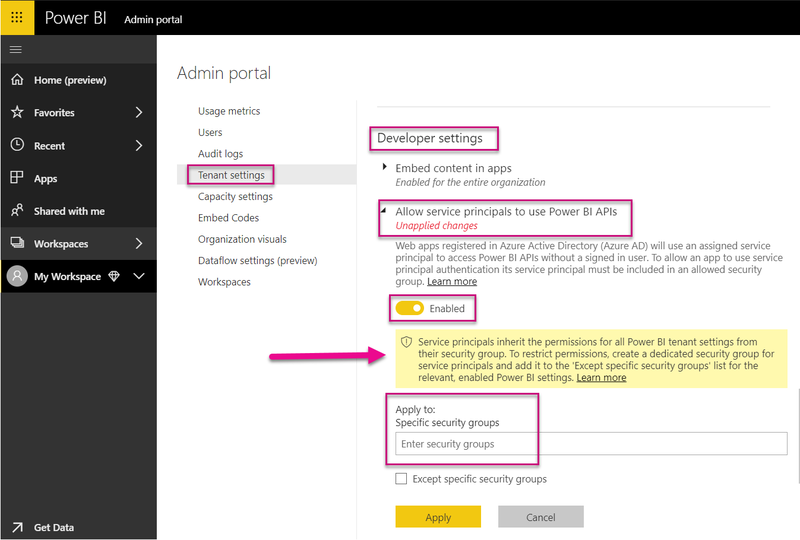 This ensures that your datasets and the Power BI service are not vulnerable to attacks. The Power BI service also imposes other limits on Python script execution. These limits ensure that user-provided scripts are performant, and moderate in the consumption of resources. 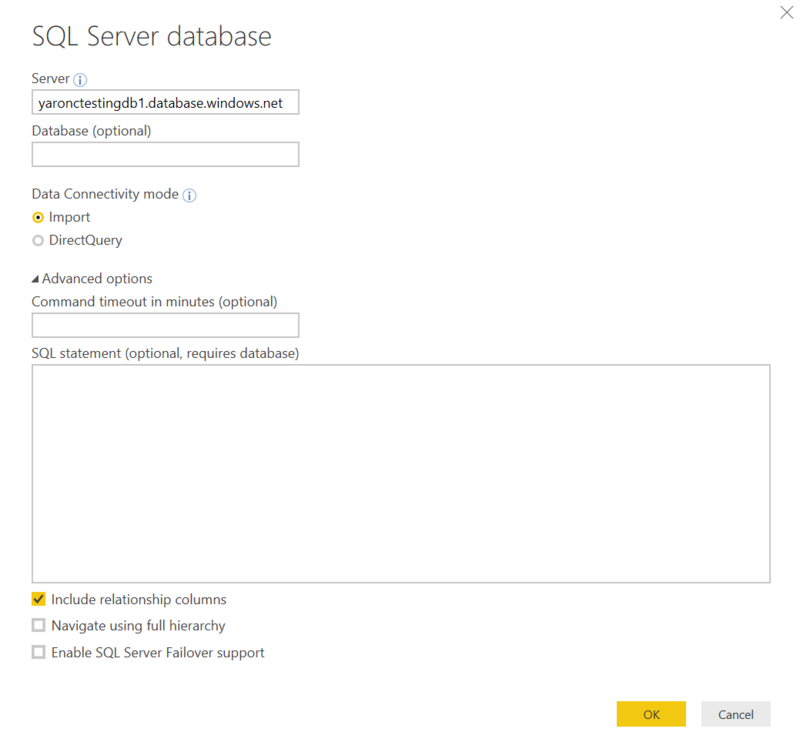 These constraints apply to the execution of Python scripts in Power BI service. Python script execution on the Power BI Desktop and personal gateway has the same dataframe size and PNG image size limits, but the execution time limit is 300 seconds. 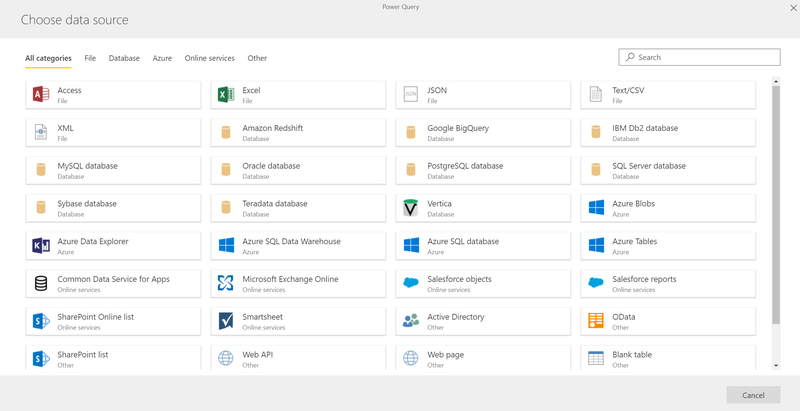 Other constraints are not applicable to Power BI Desktop and personal gateway. 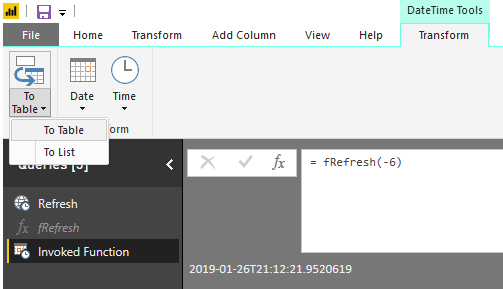 Python can be used for data preparation or for analytics in your Power BI reports, either with a Python script data connector or by using a Python script in the Power Query editor for data transformation. 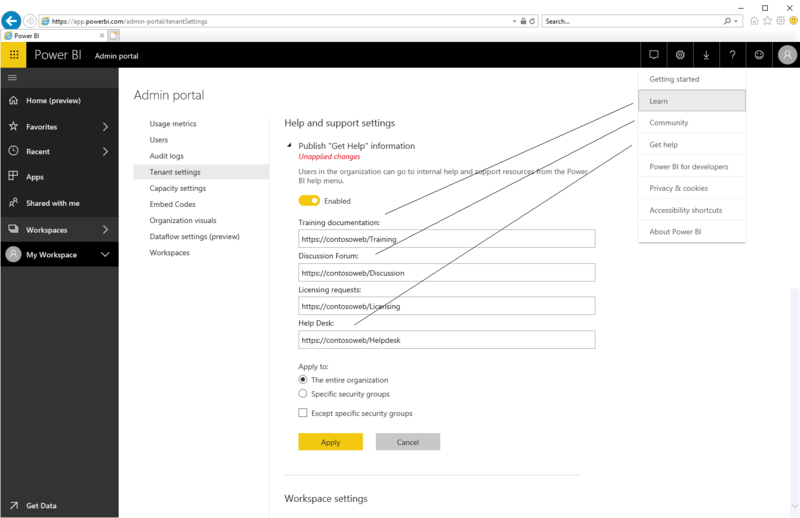 When you publish a Power BI report with Python scripts to the service, these scripts will also be executed when your data is refreshed through the on-premises data gateway in personal mode (personal gateway). To enable this, you must ensure that the Python runtime with the dependent Python packages are also installed on the machine hosting your personal gateway. Note, Python script execution is not supported for on-premises data gateways shared by multiple users. A version of the Power BI file with sample Python visuals from the earlier post, updated for publishing to the Power BI service is available here. If you have any questions, you can post them on the community forums, or you can reach me at @santoshc1. We’d love to hear your feedback and ideas. Hope you enjoy scripting with Python in Power BI! Two stores will pilot a smart technology system from the Kroger Technology team, which is connected by IoT sensors and runs on Microsoft Azure. One is located in Monroe, Ohio, near Kroger’s Cincinnati headquarters. The other is in Redmond, Washington, near Microsoft’s main campus. Enhanced Display for Grocery Environment (EDGE), a shelving system that uses digital displays instead of traditional paper tags for everything from prices and promotions to nutritional and dietary information. Scan, Bag, Go app, available on Google Play and at the Apple App Store, to create a guided shopping experience. EDGE Shelf will highlight products a customer wants to purchase, and it can help customers select items based on their preferences. Kroger has been using Restock Kroger to identify partners that will “help us reinvent the customer experience and create new profit streams,” Kroger CEO Rodney McMullen said. “Guided shopping directs shoppers through the store [using] the Scan, Bag, Go app on the most efficient route using aisle location information,” said Carley Petersen of Microsoft PR firm WE Communications. “When a customer approaches the digital shelf, they will see their item highlighted with their assigned avatar,” she told the E-Commerce Times. After scanning an item, the app switches to the next item on the customer’s shopping list, Petersen said. The facial recognition system will identify a customer’s age and gender. The idea is not to gain data about individual customers, but about customers’ behaviors and patterns, said Ray Wang, principal analyst at Constellation Research. The technology will let stores “see what are the hot promotional items, which aisles and goods are more effective, and what offers are working,” he told the E-Commerce Times. However, retailers “will have to balance consumer privacy concerns and walk the fine line between helpful and creepy when tailoring in-store digital content to individual customers,” she told the E-Commerce Times. “As brick-and-mortar retailers look to differentiate their services, providing a more interactive digital experience in stores and better enabling employees to guide, and not just check out, customers are important areas of opportunity,” Wettemann said. The success of the pilots will determine Kroger’s expansion in 2019 and beyond. Marketing the jointly developed RaaS product will “create a new profit stream for Kroger and [let] retailers save R&D capital,” Petersen added. The commercial RaaS product probably will be marketed in Q4 this year, Constellation’s Wang predicted. “This helps everyone out,” Wang noted. Other retailers purchasing the Kroger-Microsoft solution need not fear giving Kroger a foothold in their shops, because “they typically have Chinese firewalls on this,” Wang pointed out.